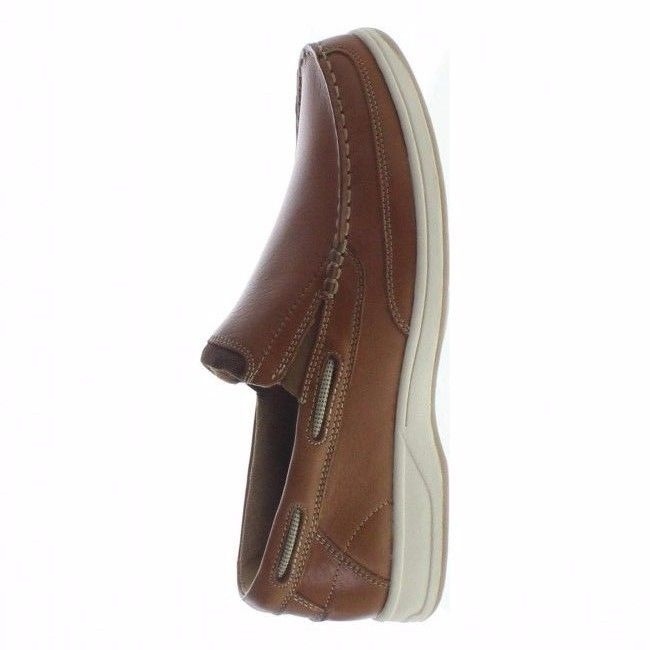 Florsheim Mens Saddle Tan Lakeside Slip Leather Boat Deck Casual Loafer Trending Shoe! You’ll be carried away in the Florsheim Riptide Moc Slip. When it comes to a casual pair that can be worn every day of the summer and fall, you couldn’t ask for a better shoe. 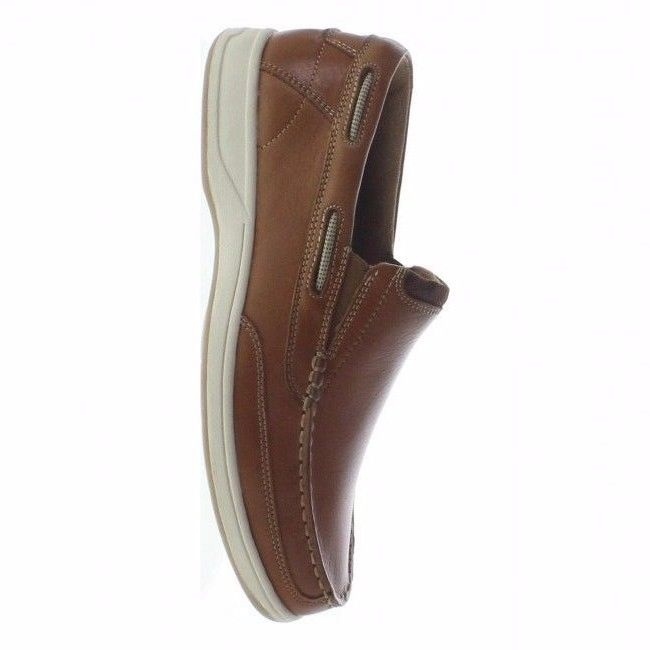 This moc toe slip-on is a trendy shoe with white soles that amp up the wearability and add a little something more. SavingonShoes accepts Visa, MasterCard, American Express, Discover, PayPal, ACH Payments, Checks and Bank Transfers. We always ship FREE to all 50 States located in the United States. Our company is based out of Illinois so shipping times and rates may vary according to our store's personal inventory, as well as inventory from our specified manufacturers. For shipments to Alaska, Hawaii, and Puerto Rico there may be a shipping surcharge. We ship worldwide! All international shipments are thoroughly inspected to assure perfect quality. International shipping time can vary depending on the country. Delays may happen during customs or in transit. Once we ship the item, we will send you a tracking number. You will be able to track the package while in the U.S. When the package arrives at customs in your country, you will no longer be able to use the tracking number. It is up to customs to see how long they will be processing the package. You are responsible for all taxes & duties that your country may charge. We mark your purchases as gifts and undervalue your purchase price by 50% for the customs form. When you place an order, an e-mail order confirmation will be sent immediately to the e-mail you've provided us. As soon as the merchandise leaves the warehouse, we will e-mail you a tracking number. We encourage you to sign up for our e-mail list. We will e-mail you with advanced notice of sales, coupons, new merchandise, and other store-related events. But, of course, you have the freedom to add or remove your name from our list at any time. Your privacy and security are of the utmost importance to us. Any information you provide us remains confidential and will not be used for any other promotional means than our own. Furthermore, any financial information such as credit card numbers given will not be kept on file, and through the purchasing process, will be automatically encrypted, charged, and discarded immediately. Secure Sockets Layer (SSL) encrypts your order information and sends it to a secure server, making it impossible for the information to be decoded by an outside party. Our team of fashion experts is available to assist you. Whether it‘s for an upcoming special occasion, or simply updating your wardrobe, we would love to give you our personal attention. E-mail us with your contact information at or reach us by phone at . Customer Satisfaction is our # 1 Goal. It is very important to us that you are completely satisfied with your purchase. Unworn merchandise may be exchanged or returned for credit within 30 days of the delivery date. When returning footwear, shoes must be placed inside of the manufacturer‘s shoebox, then into a separate shipping box or wrap it with paper. Do not write on the manufacturer‘s shoebox, tape it closed, or use it as a shipping box . Returns received without the original shoebox or taped boxes are subject to a 10% restocking fee. once we receive your package, your refund will be issued according to the payment method you selected for the original order. Shipping fees are non-refundable.